Bauer Spezialtiefbau supports the designer in different stages of project development regarding relevant foundation engineering techniques. State-of-the-art foundation engineering methods together with reliable software is used by experienced in-house designers to support clients and their engineers during preliminary stages and for the execution design. structure is considered to be of utmost importance for such designs. In addition to the standard design calculations such as the stability of the open trench during construction of a cut-off wall or slope stability considering the working loads during the execution of works on existing dams, special tasks are also performed regularly. An actual example of such task is the Sylvenstein Project – where a trench was cut next to a recently completed panel. The required initial concrete strength in the panel was analyzed using the 3D-FEM tool PLAXIS. Both Fellenius' Method and the computed settlements method were used to assess the safety level of the system – see figures. Accuracy of workmanship and the verification of the special foundation works executed are vital to us. The as-built survey of each structural element is documented to be transferred into a structural as-built drawing as per project requirements. By entering all the measurement data into an illustrative quality system the exact properties and alignments of the diaphragm wall and the achievement of the minimum panel overlap can be confirmed – see figure below. Design of challenging excavation pits and working platforms for dam projects – here support for alluvial / colluvial slopes. Based on our knowledge of construction and dimensioning of foundations Bauer developed its capacities for particular questions concerning dynamic calculation and the influence of dynamic forces on special foundation structures. One of these structures is the concrete cut-off wall below a dam construction. Calculations show that during an earthquake internal forces and deflections occur in the cut-off wall which have to be quantified and safety has to be verified. Bauer offers its know-how already in the concept and feasibility stage; in order to support the client’s engineer if desired. The suitability of the cut-off wall type and the proposed wall material have to be verified initially during these design phases, to make sure that the client receives the best possible concept for the cut-off wall. 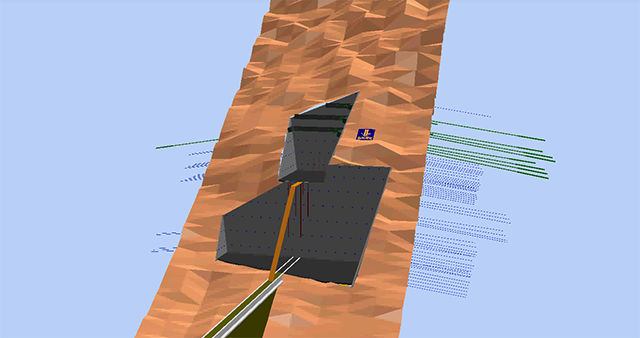 Bauer, to be in a position to provide such support, is using the finite element method programs (Plaxis 2D and 3D) to simulate the influence on the cut-off wall based on a given accelerogram.